To experience change on the Navajo Reservation, one need only close one's eyes and listen. Today an increasing number of Navajos speak only English, while very few speak only Navajo. The Navajo language continues to be taught, but it is less often practiced. 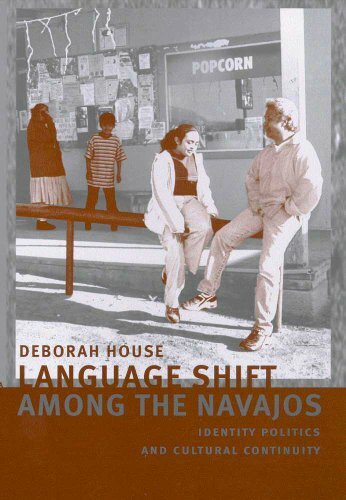 Deborah House asks why, despite the many factors that would seem to contribute to the maintenance of the Navajo language, speakers of the language continue to shift to English at such an alarming rate—and what can be done about it. Language Shift among the Navajos provides a close look at the ideological factors that intervene between the desire of the Navajos to maintain their language as an important aspect of their culture and their actual linguistic practice. Based on more than ten years of fieldwork within a Navajo institution and community, it points to ideologies held by Navajo people about their unequal relationship with the dominant American society as a primary factor in the erosion of traditional language use. House suggests that the Navajos employ their own paradigm—Sa’ah Naagháí Bik’eh Hózhóón—to learn both Western language and culture and their own without denigrating either perspective. By building on the traditional Navajo belief in harmony and balance, she advocates that those who value the language should use and teach it not just in school but also in the home, in the ceremonial hogans, and among those who cherish their heritage. Now is the time when language choices and behavior will influence whether the Navajo language lives or dies. House's book carries important lessons for anyone concerned with cultural continuity. It is a wake-up call for educators, youth, politicians, or family and community members who value Native language and culture. It remains to be seen in what language that call will be answered. View More In History & Criticism. If you have any questions about this product by Brand: University of Arizona Press, contact us by completing and submitting the form below. If you are looking for a specif part number, please include it with your message.